One of the most astonishing musical events in the history of Hudson occurred on May 12 in a great room at the Hudson Armory which is currently being changed and fitted for a library amongst other interesting things in construction. Gwen Gould brought to town for her ClaverackLanding concert series the great American Violinist Elmar Oliveira whose recitals and orchestral appearances around the world are already legendary. 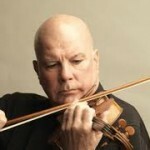 He is the only American Violinist to win the Gold medal at Moscow’s prestigious Tchaikovsky International Competition. He is also First Prize Winner at the Naumberg International Competition and the first violinist to receive the coveted Avery Fisher Prize. 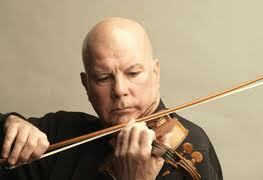 His acclaimed CD recordings run from the Baroque to the present. The recital opened with Handel’s “Sonata No. 1 in D Major for Violin and Piano.” Oliveira’s sound was thrilling, like that of the greatest full throated opera singers. His violin mastery places him in the exalted company of the greatest violinists of the 20th Century from Fritz Kreisler, Menuhin, Zimbalist, Francescatti and Joseph Szigeti. He has no rivals in the present century. In the Handel Sonata the beautiful pulsing long lines of bel canto purity touched the heart and the subtle touch of piano and forte from his fiddle reached poetry. The zest of the two allegro movements was sheer magic and the Larghetto a serene reverie. The audience at the end of the Handel rose and shouted their bravos and the applause here and throughout the concert was thunderous. The Dvorak “Sonatina for violin and piano Op. 100” is a late work the composer created in tribute to his children. It is brilliant and playful and the Larghetto second movement reminds of Rachmaninov’s great song “To The Children” bringing a passing sadness as though like in the Rachmaninov song “The children are children no more.” But joy returns quite quickly to the initial playfulness. The final movements Molto Vivace and Allegretto sweep merrily dramatically and lyrically covering the full gambit of violinistic expression. After intermission the Debussy “Sonata for violin and piano of 1916” was a tour de force with all the stops pulled out and the sonata seemed a fantastic whirligig. This fantastic Impressionist piece was all creative lightnings falling from the sky with no melodic development but intense brilliance of sound and technique again bringing the audience to their feet. The concert ended with three interesting single movement works. First Brahms’ “Sonatensatz Scherzo” had a majestic blazing brio. Then Tchaikovsky’s “Melodie Op 42 No. 3” with its ravishing melody gave Oliveira a chance again to make music soar heavenward. Pure poetry again without a trace of sentimentality and surely the highest taste and sure musical penetration. The final work on the program the violist-composer Wieniawski’s wonderfully humorous “Mazurka Op 19 No. 2” celebrates with aplomb a rustic primitive fiddle maker up in the mountains with a telling sparkle not unlike Mozart’s “A Musica Joke” – again the audience loved it. Encores came next and two delightful pieces by Fritz Kreisler the violinist-composer were just right. Pianist Robert Koenig who played the recital with Oliveira is a great artist and their perfect ensemble collaboration was just as marvelous as the concerts Robert Casadesus and Zino Franciscatti played together and recorded in the 1960’s. Mr. Koenig brought splendid sonority from his instrument and rythmic and musical dovetailing to every work on the program. This spectacular music making must return again to Hudson in the near future.